The hill state of Himachal is reeling under financial crisis with the total loan liability of Rs 46,502.42 Crore. “The situation is such that the state can’t manage without loans now. But we will try to limit it by taking continuous measures, including austerity. 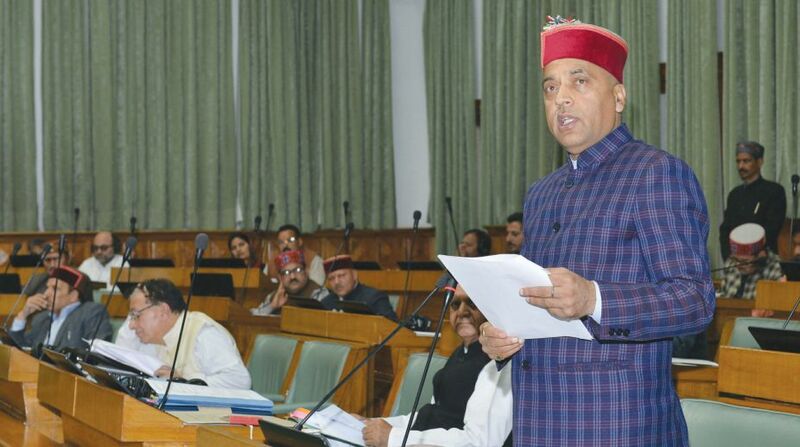 At the same time we will see that the development is not affected,” Chief Minister, Jai Ram Thakur informed the state assembly on Monday. He agreed to the suggestion by CPM member, Rakesh Singha to collectively impress upon for release of 7.19 per cent share of HP on account of Bhakra Beas Management Board (BBMB) projects along with arrears since Punjab Reorganisation Act, 1966. The Supreme Court had passed an order in this regard in 2011, but the state has not got its due so far. In reply to a question by Congress member from Nadaun, Sukhvinder Singh Sukhu, the CM said the present government had taken loan of Rs 1,000 Crore in three months from 1 January, 2018 to 31 March.”If we exclude the liabilities, the net loan amount for use is Rs 265 Crore,” he said. Thakur said the previous Congress government had taken net loan of Rs 18,787 crore of net loan in five years tenure. “The loan amount increased dangerously over the last five years because of the tendency of the previous government to open one institution after another,” he said. He said the previous government even exceeded the loan limit in 2013-14 and 2014-15. Listing some measures, the CM said while the previous government had immediately appointed Chief Parliamentary Secretaries after taking over, the present government has not. “The first cabinet meeting in previous Congress tenure had decided to purchase new cars for the ministers, we have not. The previous government had appointed so many Chairmen and Vice-Chairmen in three months time, we have not,” he compared. He said after GST, the revenue receipts have decreased, so the government will try to mobilise other resources also, mainly forests, mining and hydropower. The CM said the state had a major expectation from the Centre also, as Prime Minister, Narendra Modi has been liberal with the state. “Himachal is now getting the central funding in 90:10 (state share just ten) again in NDA rule, against the earlier trend of 60:40 or other proportions, wherein the state share was high,” he said. Thakur said the state government will inform the Centre about its financial condition and will seek help from the Centre, small or big, continuously so that development is not affected. He assured the House that the government will not take unnecessary loans and will focus on resource mobilisation in different sectors. BJP member from Jwalamukhi, Ramesh Dhawala urged the CM to have a policy on removal of fallen trees in forests and tapping of hydro potential effectively for income generation. Congress Legislature Party Leader, Mukesh Agnihotri asked the CM as to whether the government will bring a resolution in the state Assembly to impress upon the Centre collectively for a bailout package of Rs 46,000 Crore (equivalent to the loan amount) in one go.